I’ll Cry Tomorrow is one of the booziest biopics ever produced by Hollywood. Based on the autobiography of singer and professed alcoholic Lillian Roth, this glossy melodrama wastes little time on Roth’s rise to stardom and focuses almost entirely on the songbird’s downward spiral into alcoholism, depression, alcoholism, bad marriage, alcoholism, despair, and alcoholism. A more accurate title would have been I’ll Cry Tomorrow, But I’ll Drink Today. The sensationalized account of Lillian Roth’s life provided a perfect vehicle for MGM’s queen of melodrama, Susan Hayward. As the soused songstress, Hayward was given the opportunity to indulge in the overwrought style of acting in which she specialized. Whether wallowing in self pity, belting out song lyrics, tossing back slugs of whiskey, or suffering shivering fits of delirium tremens, the actress earned her Academy Award nomination by giving her all in every scene. Admittedly, by today’s standards Hayward’s “all” is a bit too much. Her extremely theatrical style of acting often pushes the film in the direction of camp; and some scenes play out like a Carol Burnett Show parody of a 50’s melodrama rather than a serious depiction of addiction. Despite Hayward’s histrionic performance (or perhaps because of it), I’ll Cry Tomorrow is a very entertaining biopic painted in silky shades of black and white. It is professionally directed, well acted (and overacted), beautifully shot, and the musical numbers are well staged. The worst that can be said for the film is that it suffers some of the problems that plague all biopics--the nagging feeling that a documentary featuring the real subject would have made a more interesting movie and the artificiality of having a single performer portray several decades of an individual’s life (the 38-year-old Hayward, while well preserved, comes off a bit ridiculous portraying Roth as a teenager). 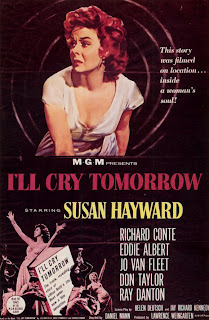 Ultimately, I’ll Cry Tomorrow is a worthy addition to the booze movie subgenre of addiction and recovery films, such as The Lost Weekend (1945) and Days of Wine and Roses (1962). Whether you choose to watch I’ll Cry Tomorrow for its depiction of alcoholism as a disease or simply view it for its camp value, it delivers big on both counts. Drinks Consumed--Whiskey, martinis (gin), champagne, wine, and unnamed cocktails. Potent Quotables--LILLIAN (narration): Every nerve in my body was screaming. I couldn’t believe this was happening to me. All I had to do was open that door and walk ten steps to the bar in my living room to find relief from this torture. Nothing could have that hold on me. I had to face it, confront it. It was the only way. I could, and I had to… I took the drink I didn’t want to take. Video Availability--I’ll Cry Tomorrow is available as a standalone DVD or as part of The Leading Ladies Collection, Vol. 2 (Warner Brothers). Similarly Sauced Cinema--Susan Hayward received her first Academy Award nomination playing another sauce-slugging songbird in Smash Up: The Story of a Woman (1947). Booze News: Stream BARFLY through Video-On-Demand! "When are they going to re-release Barfly on DVD?" 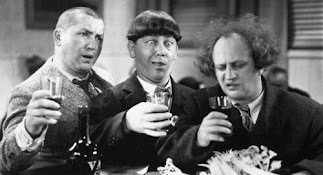 In the three years that Booze Movies has been in existence, that is the question that I've heard most often from readers. Of course, the query is understandable. In the realm of soused cinema, Barfly (1987) ranks very near the top. It is a beautifully written film that manages to be funny, romantic, dramatic, and scuzzy all at once. What's not to love about a film with a Charles Bukowski screenplay and Oscar-caliber work from stars Mickey Rourke and Faye Dunaway? Warner Home Video briefly released a nice, widescreen print of Barfly on DVD, but the disc quickly went out-of-print. Since then, the original Warner Barfly DVD has become a collector's item, demanding highly inflated prices from re-sellers, and even the Barfly [VHS] tape has been in high demand. While there is still no word on a DVD re-release of Barfly, I'm happy to report that the film is now widely available once more--this time as a Video-On-Demand rental that you can stream directly on your computer (or television if you have a Roku player). Currently both Amazon Video On Demand and iReel.com offer the film as a 24-hour rental for just $2.99. I haven't watched either stream, so I can't tell you whether the video quality is better through one service or the other. However, there are specific advantages of each stream. Amazon Video On Demand can be streamed to your computer or directly to your television if you have a Roku box or compatible device. The iReel.com stream is computer-only, but that site also offers a subscription service where you can stream as many of their films as you want for a single monthly fee. Whichever service you decide to use, it's worth raising a glass to having Barfly readily available once again!